McLeod Plantation is located along Wappoo Creek on James Island in Charleston County. It was named for William Wallace McLeod, who acquired the plantation in 1851. The plantation has had an especially important past serving as a hospital for the Confederacy, a camp for the famed 54th and 55th Massachusetts Volunteers, a burial ground for slaves and Union soldiers, and a headquarters office for the Freedmen's Bureau. Until recently, it has also had a precarious future. McLeod is unusual in that it lies in the heart of what is now a busy commercial district. The house, avenue of oaks, slave cabins, and lone remaining field are surrounded by a major highway, several fast food restaurants, a grocery store, and a multi-story medical complex. The last living family member, William McLeod, died about 20 years ago. Having no heirs, he left his property to the Historic Charleston Foundation, hoping that this group would help preserve the plantation's history and protect the land from development. In his will, he asked that the house remain a "single-family home" and that the foundation save "the Oak Avenues, and ... provide that as much of the property as possible be restricted to single family residence or residences having the lowest possible density." Instead, the foundation decided to sell the property to the American College of Building Arts for use as a campus. 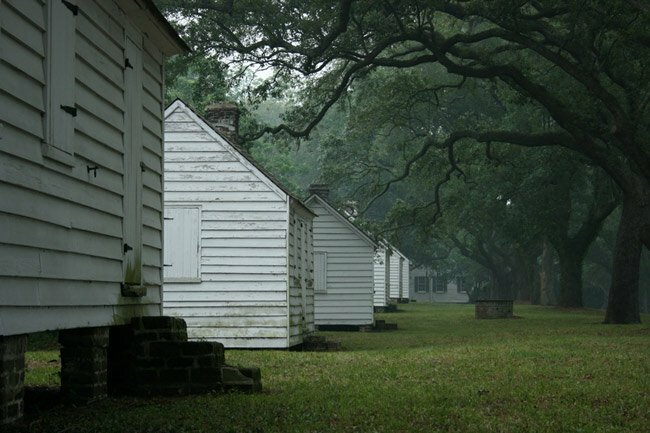 The college, which was not financially stable despite receiving a large loan from the City of Charleston, eventually sold the plantation back to the Historic Charleston Foundation (a stipulation of the original sale). The Historic Charleston Foundation then tried to sell McLeod Plantation to the College of Charleston, which planned to use the house for entertaining and the land for intramural sports. Strong opposition from Civil War historians, African-American historians, and the people of James Island led the college to forgo the purchase. To the relief of the surrounding community, the plantation will be purchased by Charleston County Parks and Recreation later this month. The county plans to restore the site, which has fallen into disrepair, and open it for public use. Special thanks to James Island native Beverly Christ for submitting this picture, which she took in July 2009. Grab your dancing shoes, practice your six-count, and get ready to start shagging! The National Shag Dance Championship started in 1984 and is the longest continuously running shag dance contest in the country. Past winners have gone on to perform on countless shows and events including Good Morning America, CBS This Morning, PGA banquets, NBA games, the Beach Music Awards, and more! Want to see the full calendar? Just click here to check out SCIWAY's complete calendar of March SC events! Also, remember that all our event calendars, for every month of the year, are available on SCIWAY's website 24/7/365 – just go to https://www.sciway.net/calendar.html.